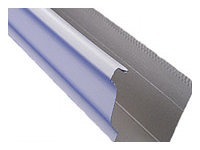 Aluminum and steel gutters come in a variety of colors. Choose colors that will blend with your house. The gutters and downspouts are available in a number of different colors. Sectional aluminum and steel gutters come in more than 35 different colors – ideal for matching trim and house colors. Gutter colors are baked on at the factory. These coatings generally provide stain resistance, making gutters easy to maintain. Some manufacturer coatings allow surface residue to be easily removed with conventional cleaning solutions and detergents and a clean water rinse. Vinyl gutter material typically is brown or white. The latter color holds up better in intense sun. Copper is prized for its natural color and comes unpainted. If you like the look of copper but not the price, some manufacturers sell a faux-copper gutter made of aluminum. We provide aluminum gutters in the colors listed below. Please note that the screen representation of the colors below may not represent the true color. Please make color selection at time of estimate to ensure proper color match. ​These images are to give you an idea of the colors offered. Most residential and commercial rain gutters are fabricated from .027″ or .032″ aluminum with baked on enamel finish. Aluminum is an ideal metal choice for the majority of residential gutters because it will not rust and has a longer shelf life than the traditional steel made gutters. Traditional bead half round in 5″, 6″, 7″ and 8″ sizes for both residential and commercial applications. 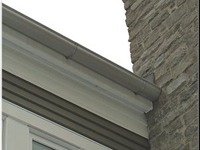 Most homes in North American use the K-Style rain gutter profile. K-Style has a similar appearance to the old traditional Ogee Profile gutter of a bygone era. Today K-Style gutters are roll formed using various sizes and thicknesses of coil stock. K-Style gutters are available profile sizes of 5″, 6″, 7″, and 8″ sizes. Most residential homes use either 5″ or 6″ size. Commercial buildings, churches, warehouses and small shopping centers use larger 7″ and 8″ K-Style gutter system. Larger sizes are available upon request. 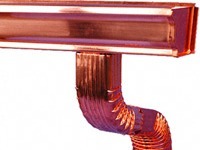 We offer a wide selection of copper gutter systems. We have the finest selection of Ogee-Style, Half Round, and custom profiles available for the discriminating contractor, builder or homeowner. Copper offers a very distinctive appearance and will eventually patina to brownish and later greenish. Copper has been used as an ideal roofing and gutter metal for thousands of years dating back to ancient civilizations. 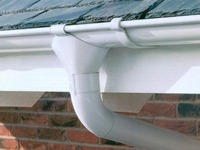 Half-round gutters have been a traditional favorite and have recently become more popular. The simple lines of copper half-round offer a great compliment to even homes with slate, tile and cedar shake roofs. Rick’s Rain Gutters has everything you need for a complete 5” Half-Round Single Bead 16oz. Copper gutter system. We offer a wide selection of copper half-round gutters. Availability in traditional single bead or reverse bead profiles. Custom copper half-round sizes are also available upon request. 5” and 6” Ogee Style 16oz. Copper Gutters Everything you need for a complete 5” and 6” Ogee Style 16oz. Copper gutter system. All gutter components are fabricated from high grade 16oz. copper. Galvalume and Zincalum are steel, with a coating of aluminum and zinc. The result is a strong, durable metal with proven long term corrosion resistance. The coating is 55% Aluminum and 45% Zinc and is applied to the steel sheet by a continuous hot dipping process. The Result… The coating shields the steel from moisture and contaminants while providing protection at scratches and cut edges. The process gives steel the unique combination of strength, long term corrosion resistance, with galvanic protection at cuts and bends in the material. as a uniform, architectural shine that weathers evenly. - Resists fingerprints and smudging. - Its roll formed dry so there are no oils. Galvalume was first manufactured in 1975 and has been thoroughly tested in many types of environments. Depending on the location (proximity to the ocean, industrial areas, etc.) of the installation, Galvalume and Zincalum have approximately nine times the longevity of galvanized steel. Hot-dip galvanized steel has been effectively used for more than 150 years. The value of hot-dip galvanizing stems from the relative corrosion resistance of zinc, which under most service conditions, is considerably better than iron and steel. In addition to forming a physical barrier against corrosion, zinc, applied as a hot-dip galvanized coating, cathodically protects exposed steel.